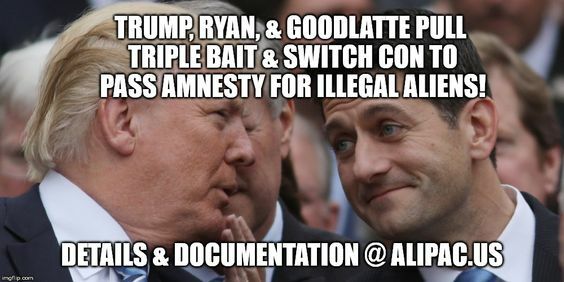 You both know full well that any legislative promises of changing migration reductions, border walls, and e-verify won't mean a hill of beans if any form of Amnesty for DACA illegals passes. I always thought NumbersUSA was made up of men and women of reason with a clear understanding of this national battle. But now you take us to the brink of Amnesty trying to cut some deal that you have ZERO power to assure will be honored. 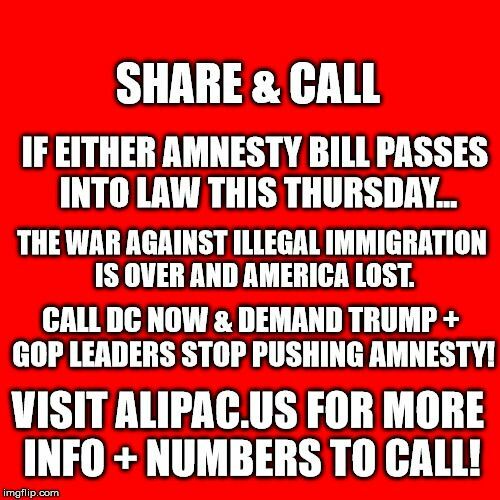 If this thing passes, everyone will know NumbersUSA getting sucked up into the DC schmoozefest with Trump will be the reason the Open Borders Lobby won the war. Giving the illegals and open borders lobby what they want... what a strategy. The future 100 years of Barack Obama, Bernie Sanders, and Hillary Clinton type Presidents you are about to create with millions more imported voters, will wipe their asses with the paper this bad deal is written on. The courts will slap full citizenship on the beneficiaries of your Goodlatte Dream Act Bill within 5 years and you know it. I supported you with all my heart and energies for over a decade. Shame on all of you for letting so many of us down. Beezer, patbrunz, lorrie and 8 others like this. EXACTLY! What a disappointment they have become! avenger, hattiecat, Beezer and 2 others like this. Very simple. Amnesty begets amnesty. No need to repeat it. It will result in eventual citizenship for illegal aliens and the immediate declared birthright citizenship for millions of new babies born to this protected group.. The parents given amnesty and their children will continue social unrest to transform the United States to their social justice, open border type thinking. They will do it by their numbers, by making demands and by force if necessary from what we have witnessed over thirty years. NumbersUSA knows that illegal aliens granted amnesty will continue to demand an amnesty for their relatives, including parents, siblings, extended family, those still living in whatever country to get a chance at stealing from America. Democrats will gladly give more amnesties to grow that permanent voting block. Our cities will continue to devolve into squalor and lost jobs for Americans. Schools will continue to struggle to accommodate languages, sometimes up to a hundred, and no one really learns. Sidwell Friends, other private and elite schools would not allow this invasion into their schools. Sadly, NumbersUSA gets an "F" for its support for any type of amnesty. jtdc, avenger, southBronx and 5 others like this. You are so right, GeorgiaPeach and so well said!! President Trump, please copy GeorgiaPeach's comment and put in your statements on why no DACA Deal!! Beezer, GeorgiaPeach, ALIPAC and 1 others like this. NumbersUSA should be writing letters to ALIPAC for collaboration and strategy. Judy and patbrunz like this. 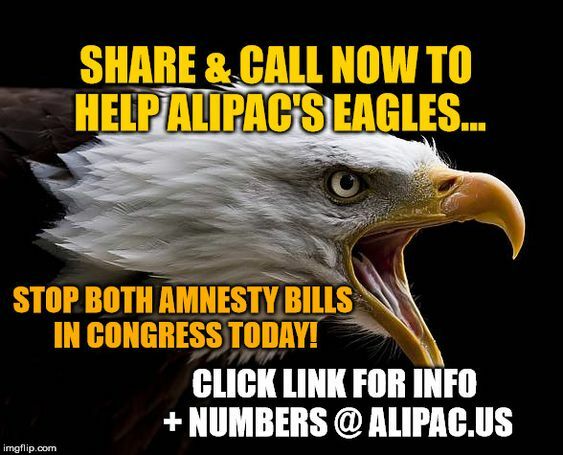 ALIPAC Eagle volunteers are now on the ground in DC visiting GOP lawmaker offices with our distinctive flyer opposing both Amnesty bills to be voted on within 24 hours!